The Galaxy S5 is here, but just how much better is it than last year's model? There's a new king in town. The Samsung Galaxy S5 is finally here, taking its place at the top of Samsung's range and arguably as the face of Android itself. There's been a lot of anticipation and hype, almost too much to live up to, but the Samsung Galaxy S4 is almost a year old and has faced incredibly stiff competition from the likes of the HTC One and the LG G2. Samsung is no longer the only big name in Android and the need for a shiny new flagship has never been greater. That doesn't mean the Galaxy S4 is now redundant; it's still a great phone and still at the higher end of the market, if anything this will just open it up to new buyers. It's already down to around £350 SIM free and that price is likely to drop further once the S5 is in shops, which itself will probably cost at least £500. So before running out and buying the latest and greatest, read on to see just how it stacks up to the S4. The Samsung Galaxy S4 has a 5 inch 1080 x 1920 Super AMOLED screen with a pixel density of 441 pixels per inch. In our review we said the Galaxy S4 had the best display you could find on a smartphone and it's certainly still up there. 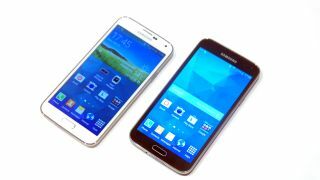 The Samsung Galaxy S5 marginally ups the size to a 5.1-inch Full HD display and it's still Super AMOLED, so not a massive change. In fact if anything it's slightly less sharp as that extra 0.1 inch brings it down to 432ppi. One of the few aspects of the Galaxy S4 that we weren't so thrilled by was its design. While Sony experimented with glass and metal and HTC put everyone to shame with its aluminium unibody HTC One, Samsung stuck with plastic. It feels solid enough and the faux-metallic band around the edge gives it a touch of class but it just doesn't seem as premium as the competition. The design has changed a little in the Galaxy S5. It's still plastic sadly, but this time the look is more industrial than inspired by nature and it feels more solid in the hand. At 142 x 72.5 x 8.1mm and 145g it's slightly bigger and heavier than the Galaxy S4, which is 136.6 x 69.8 x 7.9mm and 130g. The Samsung Galaxy S4 already runs the latest version of Android (4.4.2 KitKat), so the two phones are identical in that sense. They also both use Samsung's TouchWiz interface and while the notifications bar and lockscreen have been changed for the Galaxy S5 on the whole they're not drastically different. But what changes there are seem to be for the better. For example, the notifications screen gives you quick access to more settings. The Galaxy S4 has a 2600 mAh battery which gives it an above average amount of juice. We found that with medium to low usage you'll still have around 50% battery at the end of the day and even with heavy usage it should easily last you till you get in from work and can attach it to a charger. The Galaxy S5 has a slightly bigger 2800 mAh battery, and Samsung claims its better too, supposedly surviving up to 10 hours of web browsing or 12 hours of video. Obviously until we've put it through its paces we won't know for sure how true that is. If nothing else though it has an Ultra Power Saving Mode which shuts down all none-essential features and makes the display black and white to maximise its battery life. The 1.9GHz quad-core Snapdragon 600 processor and 2GB of RAM packed into the Galaxy S4 ensure it's slick and powerful, but it's since been topped by newer, faster processors, such as the 2.5GHz quad-core Krait processor found in the Galaxy S5. The S5 still sticks with 2GB of RAM.